Hela's Folly is a small shipwreck northeast of Dawnstar. The fast travel point is just to the south of the bow of the wreck. The camp is a few paces to the west-southwest. Kill Deekus: Slay an Argonian looting a shipwreck. There is a makeshift camp next to the wreck which is the home of an Argonian named Deekus. Everything in the camp is marked as owned and is counted as stealing if taken, even after you kill him. 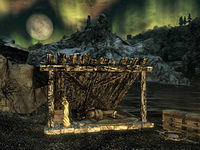 The camp consists of a lean-to, beneath which is a bed roll, a Dibella statue, and an open crate containing two amethysts, a sapphire and a filled lesser soul gem. To the right of the lean-to is a novice-locked chest "protected" by two bear traps—one in front and one behind it. There are three crates between the chest and a campfire which has three salmon cooking over it. To the north is another crate with a medium coin purse, a loose coin, an amethyst, and an emerald on top. There are two barrels by the crate and on top of one of them is a soul gem fragment and a sapphire. On the shore, to the east of the wreck is a clam that can be harvested for clam meat. Another chest can be found underwater in the northwest part of the ship. There are also several gems underwater, almost directly underneath the chest. This includes one ruby and one sapphire on the lower deck of the submerged half, between some crates near a plant. If you are sent here to retrieve the Helm of Winterhold for Jarl Korir, it will be in the chest owned by Deekus, and thus considered theft. Korir will still accept it to complete the quest, however. 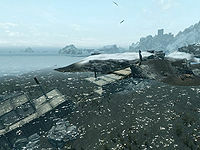 You can become stuck between rocks and the wrecked ship just a few paces forward from the fast-travel spawning point. ? Fast-traveling back to Hela's Folly seems to fix this. This page was last modified on 22 May 2018, at 18:42.